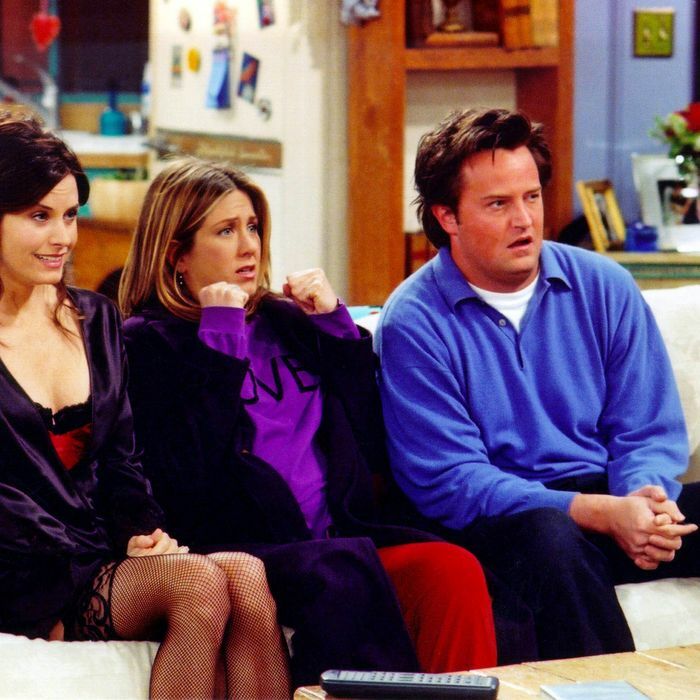 For a show that lasted ten seasons, Friends left remarkably few scenes on the cutting-room floor. There’s the infamous airport-security subplot cut after 9/11, the wardrobe malfunction at Monica and Chandler’s wedding, and plenty of choice Chandler and Joey moments, naturally. (A 2012 Blu-ray edition of the show didn’t even include the deleted scenes, which were on the previously released DVD sets.) For fans who can’t get enough of the gang, though, we’ve compiled the best bits you didn’t see on TV. Turns out Monica and Ross didn’t completely bury the hatchet after the Thanksgiving football game. In this cut closing-credits scene, we see what really happened to the Geller Cup. Trapped in an ATM vestibule — yes, vestibule — during the blackout, pre-Monica Chandler tries to put the moves on actual Victoria’s Secret model Jill Goodacre. It’s Phoebe’s baby shower, and she’ll kick and scream if she wants to. “Hormones”! Phoebe finds a very Phoebe way to drown out the sound of her fire alarm. Ross gets choked up about Monica and Chandler’s ceremony (and predictably makes it all about him). Later, Chandler hits the dance floor with Mama Geller. Monica and Chandler’s honeymoon gets off to a rocky start when they’re detained by airport security. The entire subplot was cut after 9/11 and replaced with the one where the newlyweds compete with another couple for travel perks. Rachel rounds up the gang to watch Emma crawl for the first time, but Phoebe’s the real star of this scene. Joey gets very invested in Emma’s bedtime story. All together now: awwww. The month is almost over, so check out the rest of our Friends Countdown.